Val Con and Miri’s 30th Anniversary News! Sharon Lee and Steve Miller will be signing, reading, and talking (you just try to stop us from talking) about the Thirtieth Anniversary Edition of Agent of Change, at the Children’s Book Cellar, 52 Main Street, Waterville, Maine from 7-10 pm on Friday, November 2 — Hey! That’s this Friday! Everybody — that means you in the back, there, too! — Everybody is invited to this gala event. It’s free — so, come help us, Miri, Val Con, Edger, and the entire cast of characters from the Very First Liaden Universe® novel ever published — celebrate this important science fictional anniversary! 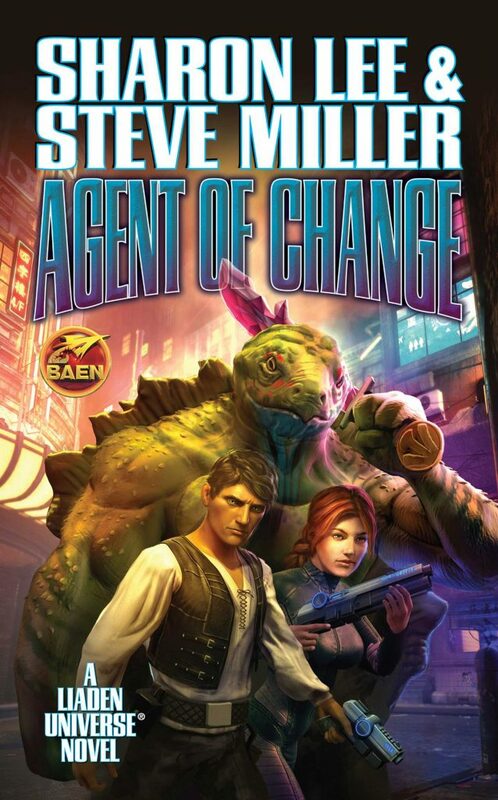 If you are unable to attend the November 2 event, but you want a signed copy of the anniversary edition of Agent of Change, with the awesome Sam Kennedy cover, you may send an email before November 2 (that is BEFORE this Friday) to Ellen Richmond at kidsbookscellarATmyfairpointDOTnet, with “Lee and Miller” in the subject line. In the body of the letter let Ellen know how many books you want, your snail address, and any personalization request you may have. She will contact you for further necessary information. So, everybody has this important date inked-in on the calendar, right? Right! Val con and Miri. Still my favorites. Random suggestion, you might wish to send the free Kindle edition of Agent of Change on a vacation for a while. Next Next post: Reading and Book Signing Tonight!